Thus begins this dazzling fantasy novel that invites comparisons with the work of J.R.R. Tolkien, Arthur C. Clarke, and Ursula Le Quin. It opens up a whole world of wonder, not in far-flung galaxies but in our own distant past on Earth—a world that will captivate not only science-fiction and fantasy fans but also those who enjoy literate thrillers.The group that passes through the time-portal finds an unforeseen strangeness on the other side. Far from being uninhabited, Pliocene Europe is the home of two warring races from another planet. There is the knightly race of the Tanu—handsome, arrogant, and possessing vast powers of psychokinesis and telepathy. And there is the outcast race of Firvulag—dwarfish, malev-o olent, and gifted with their own supernormal skills. 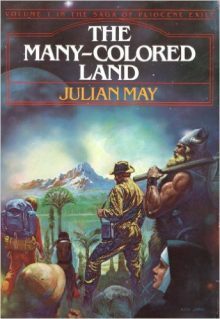 Taken captive by the Tanu and transported through the primordial European landscape, the humans manage to break free, join in an uneasy alliance with the forest-dwelling Firvulag, and, finally, launch an attack against the Tanu city of light on the banks of a river that, eons later, would be called the Rhine.